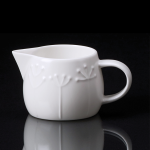 REPEAT REPEAT SMALL JUG – This dainty bone china jug is perfect for a little milk or cream. It has mid-century style floral motifs and matches the Tulip Sprig espresso sugar bowl. Holds approx. 100ml, Dishwasher and Micrawave safe.